Due to the snow day, there will be school for students and staff on April 5th. We have no supervision for students before 8:25 a.m. No students may be on campus before 8:25 a.m. unless eating breakfast (Breakfast is 8:15-8:40 in the MPR). Parents are to drop off students off in the crosswalk area by our middle main blue gate in our front parking lot off of El Paseo. Please wait in line to drop-off your child. Do not pass other cars (even if there seems to be room ahead). After you drop-off your child, you may proceed cautiously in the lane to exit. If you want to accompany your child onto campus in the morning (ie. walking students to breakfast or to class), you must legally park in the parking lot, enter office, sign in and get a visitor pass, and then walk onto campus. Some mornings the office is busy, please be patient and wait to sign in. Signing in is for the safety and security of staff and students. If you want to visit the classroom teacher before school, please make an appointment ahead of time with the teacher. Please take the time to sign out in the office before leaving. Again, this is for the security of the entire campus. Parents must pick-up children in the upper parking lot by the MPR. Parking can be tight, so please arrive early and have patience. Parents/Guardians must park, go into the MPR through the far designated entrance door, pick up child, and exit through the designated exit door (so traffic jams don’t ensue). Parents are not to pick up students or enter the campus at the blue gate at the front of the school after school. This is an exit for east side walkers and bus students only. If you want to visit your child for lunch, you must come in and check in at the office and get a visitor sticker using the RAPTOR Visitor System. You may eat lunch with your child only on Friday’s, not other students. Please remember to sign out and leave your badge as you leave the campus. Faculty and staff at Oasis Elementary School believe in helping students become good citizens and lifelong learners using the Bobcat Way. Please take some time to read about our school's rules and procedures. 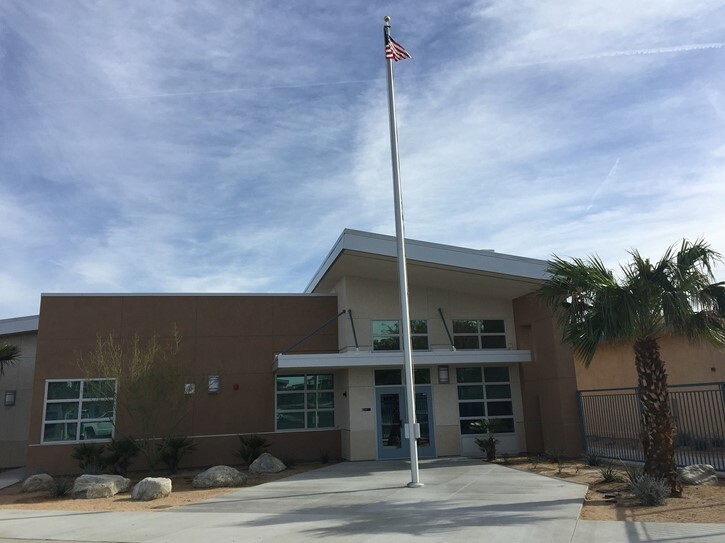 The purpose of the School Accountability Report Card is to provide parents with information about Oasis Elementary School’s instructional programs, academic achievement, materials and facilities, and the staff. Our SSC meetings are the first Thursday of each school month at 7:45 in the office conference room. These meetings deal with governance and oversight of Oasis Elementary and are always open to the public. The agendas and minutes are posted under the Parent section. Learn with grit and tenacity. School does not start until 10:45 on late start days. Breakfast is not served on those days. Our school office is open from 8:00 a.m. until 3:30 p.m. If you would like to meet with Ms. Hopton or one of our teachers, it is requested that you make an appointment before you come. When you visit Oasis, we require all parents to come to the Office to sign in and get a visitor/s pass. Enroll your student online here. Click on the link to find informatin about the transitional kindergarten waiver.